If you’re going to write a complex and difficult lead character using first-person narration, you’d better be pretty darn good at it, or the character may come off as erratic, unsympathetic, and ultimately render the entire plot unbelievable. 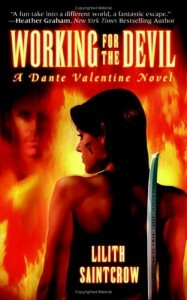 For example, given her volatile mood swings and lack of impulse control, I find it impossible to believe that Dante Valentine has the discipline of mind necessary to be a world-class Necromance. Given her egocentric view of the world and propensity for lashing out at everyone she encounters, I find it impossible to believe that she inspires such loyalty from everyone around her, including a powerful demon who’s known her all of a week or two but claims she treats him with greater decency than anyone he’s ever known. This character has apparently been through a lot in life, particularly in the last few years, and everyone who knew her when would still move heaven and earth for her. And yet, it doesn’t sound like she was any more emotionally stable then, either. So if there’s going to be no introspection or logical thought progression on the part of the character narrating her own story, this is where an author needs to show us how others see her, because she’s doing nothing to charm the pants off the reader on her own. And while I have other complaints (like the terrifying and sinister villain of unspeakable evil who’s haunted her dreams for years but turns into a total Chatty Cathy info dump when he finally does turn up), this is where the story really falls short for me, because Dante “Danny” Valentine pays very little attention to the emotional lives of those around her, and when she does bother to wonder what someone’s thinking, she’s either jumping to conclusions that make no sense or finding the object of her curiosity utterly inscrutable. She’s as insulated from empathy as a psychopath and yet is constantly spewing her own emotional turmoil at the world, often violently. Which means much of what happens is tiresome and makes no sense whatsoever. All of which could still be interesting, if it were being told from a more objective viewpoint instead of being filtered through the neurotic herself. You just never get a break from this nutjob!